The Lifeboat and Slipway at Brims. This Lifeboat Station and Slipway was built in 1906 at the cost of £2,975-1-9d. The Lifeboat shed has accommodated lifeboats for 93 years, from the days of the Anne Miles (1906- 1926) up to the modern Lifeboat Lord Saltoun (1988- 1999). 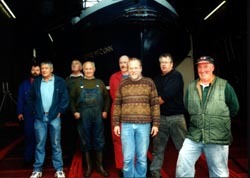 On the 11th of September 1999 the Lord Saltoun was launched for the last time, with a special ceremony to mark the end of an era which spanned 125 years of Lifeboats being launched from Brims into Aith Hope. This shed now houses the old Longhope Lifeboat Thomas McCunn and is being run as a museum by the Longhope Lifeboat Museum Trust. There is a large amount of material waiting to be copied to our archive. Anyone with a picture, map, painting, old documents or even a story that they would like to contribute, please do not hesitate to contact us.